Easy-To-Use Demonstrators Make Great Selling Tools! Getting in front of a customer is expensive and hard to do. 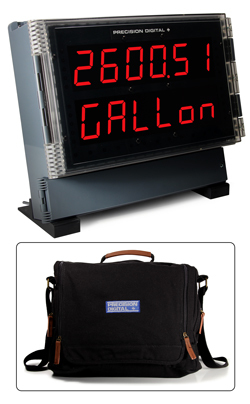 Precision Digital's demonstrator kits help you make the most of this precious time. 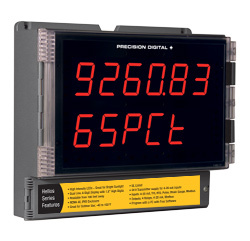 Precision Digital offers a variety of demo meter kits for various types of process instrumentation. From ProVu panel meters and rate totalizers to ProtEX explosion-proof meters and Modbus® scanners, these demos are an impressive way to show a product's features and let customers see how the product works first hand. 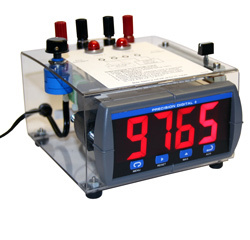 Many of the panel mounted demo meters are built into a convenient carrying case or a clear plastic box, making them quick and easy to set up and show to your customer. The panel mounted demos are specially designed with control dials, relay/alarm status lights, acknowledge and reset buttons, programming switches, slide controls, and some even feature the ability to connect an external device such as a transmitter or calibrator. The ProtEX explosion-proof and Vantageview demos are stored in convenient hard plastic cases with molded foam interior for ultimate protection. Most ProtEX demo models come with a power cord and a pre-wired signal generator to simulate 4-20 mA input. Some models are battery powered making it even more convenient to power up and demonstrate. Note: All available demos are not intended for resale. 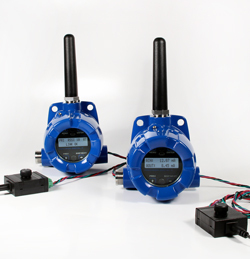 The PDDW30 wireless bridge demo kit gives you a simple, straightforward way to get an analog, discrete, or Modbus® signal from where you have it to where you need it. It's a point-to-point wireless bridge packaged in a rugged, weather-tight housing that is designed to meet the demands of industrial installations. The primary unit accepts an analog, discrete, or Modbus® input and wirelessly broadcasts it to the secondary unit. The secondary unit then recreates that signal at its location. Just put the units in the field wherever you have a process signal and 24 VDC power. Demo Kit Includes: A primary PDW30 unit, secondary PDW30 unit, two PDA20 signal generators, two power cords, and convenient, protective carrying case. Kit Includes: Handheld unit, target unit, documentation CD, and convenient, protective carrying case with printed instructions. 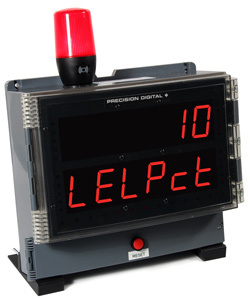 This PDD2-6000 Helios demonstrator is impressive with its superluminous sunlight readable dual-line display, each with large 1.8 inch (46 mm) tall digits. This demo unit is not just for showing off its pretty display! 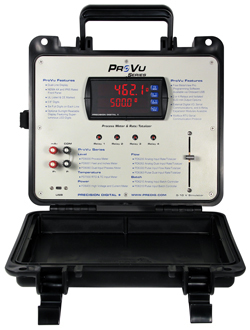 It is also packed with all the great features of the ProVu® PD6000 panel meter. The unit also comes preloaded with USB programming software and a standard USB cable, so you can see how easy it is to connect the Helios demo unit to your PC and load the software. When demonstrating the Helios, be sure to stand about 100 feet away and show how big and bright this display really is! Demo Kit Includes: Helios model PDD2-6000-6H7 inside, standard USB cable, power cord, convenient black canvas carrying bag with shoulder strap. This PDD2-6000-GD Helios demonstrator comes with a light, a horn, and a reset button wired and programmed for a gas detection application. The demo also includes a signal generator, so you can vary the input and demonstrate how the light, horn and reset button operate. The demo is scaled for 4-20 mA = 0 to 100 LEL and the horn and light come on at 20. The horn can be reset at any time with the reset switch and the light will automatically go out when the LEL falls below 15. When demonstrating the Helios, be sure to stand about 100 feet away and show how big and bright this display really is! Demo Kit Includes: Helios model PDD2-6000-6H7 inside, standard USB cable, power cord, Light, Horn, Reset Button wired and programmed. This PDD2-6000-PA Helios demonstrator comes with a light, a horn, and a reset button wired and programmed for a pump alternation application. The demo also includes a signal generator, so you can vary the input and demonstrate how the light, horn and reset button operate. The demo is scaled for 4-20 mA = 0.0 to 15 feet and the horn and light come on at 14 feet. The horn can be reset at any time with the reset switch and the light will automatically go out when the level falls below 10.0. When demonstrating the Helios, be sure to stand about 100 feet away and show how big and bright this display really is! The PDD6600 Loop Leader demo is equipped with two meters that allow you to demonstrate many features of the loop-powered Loop Leader PD6600 series. The top meter can be toggled between a PD6604 process meter and the PD6624 rate/totalizer, both with bargraph. 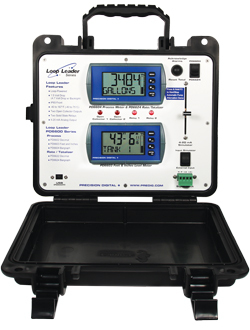 The bottom meter is a PD6603 Feet & Inches process meter, great for showing a level application. Demonstrating an application is easy with the PDD6600 and it has several ways to do it. Press and hold the F3 button on the top meter to see an automatic pump alternation demo. Simulate an application by setting the input toggle switch to the input simulator and moving the 4-20 mA simulator slide control up or down. Lastly, you can toggle to the external input and hook up a real transmitter to the signal input connector. Two open collector LEDs and two relay LEDs will activate on programmed set points. Demo Kit Includes: PD6624, PD6603, acknowledge alarms & reset total button, toggle switch for PD6604/PD6624, toggle switch for input simulator/external input, 4-20 mA simulator slide control, two open collector LEDs, two relay LEDs, signal input connector, USB port for PD6624, power cord, USB cable, and a convenient, easy-to-carry case. This ProVu demonstrator allows you to quickly demonstrate Precision Digital's PD6000 & PD6200 ProVu meters and one of your transmitters or calibrators. The demonstrator makes it easier to show your transmitter in action because it can provide the necessary power. The PDD6000 can also be used as a stand-alone demo to make the last five minutes of your sales call more productive. All you have to do is plug it in and adjust the potentiometer that simulates a voltage input (PV). You can use the built-in LEDs to demonstrate the ProVu's alarm, logic output, and control capabilities. Demo Kit Includes: ProVu model PD6200-6H4 inside, analog input, transmitter supply, USB port, relay status indicators, an analog input simulator, ProVu demonstrator instruction manual, micro-USB cable, and convenient, easy-to-carry case. 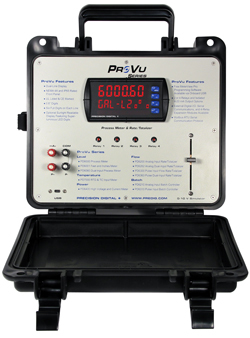 The PDD6210 ProVu demo meter is a dual-line 6-digit batch controller built into a convenient, easy-to-carry case, and loaded with useful functions and features. It features a potentiometer that simulates a voltage input and can accept current signal inputs from an external device such as a transmitter or calibrator. Its features include start/pause/stop, change batch with front buttons, display batch total, rate, grand total, count or preset, single or multi-stage batch control (up to 8 relays), automatic overrun correction, rate in units per second, minute, hour, or day, automatic or manual batch control, low or high flow alarms while batching, and more. Demo Kit Includes: PD6210-6H4 ProVu dual line 6-digit batch controller, analog input, transmitter supply, USB port, relay status indicators, an analog input simulator, micro-USB cable, and convenient, easy-to-carry case. The Trident Demo allows you to quickly demonstrate Precision Digital's PD765 Trident meter and one of your transmitters or calibrators. It's actually easier to demo your transmitter using the Demonstrator because it can power the transmitter. The Trident Demo can be used as a standalone demo that will make the last five minutes of your sales call more productive. When you are done with the primary focus of the call, take five minutes for the Trident Demo. All you have to do is plug it in and adjust one of the two potentiometers that simulate RTD and voltage inputs. You can use the two built-in lights to demonstrate the Trident's alarm and control capabilities. Demo Kit Includes: Trident model PD765-6X2-10 inside, 0-10 V potentiometer, RTD simulator, PDA7232 Trident RS-232 adapter, 2 LED relay indicators, power supply and signal input posts, MeterView software for programming on a PC, and a clear polycarbonate enclosure to house the electronics. 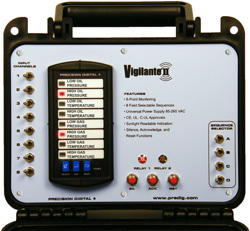 The PDD158 Vigilante II demo is an eight channel annunciator built into a convenient, easy-to-carry case, and loaded with features found previously in annunciators three or four times their size. It can be programmed for all the common ISA alarm sequences, accept switch, transistor, and logic level inputs. Features include 8-point monitoring, free custom message labels, type 4X, NEMA 4X, IP65 front, universal power supply 85-265 VAC, sunlight readable indication, and more. Demo Kit Includes: Vigilante II model PD158-6R2-1 inside, 8 switch contact inputs, ISA sequence programming switches, 2 relay status lights, external silence, acknowledge, and reset buttons, a convenient, easy-to-carry case. The PDDS178X2 Watchdog Demo is a temperature scanning & alarm system that combines the Trident X2 process and temperature meter, the Minimux II scanner, and a PDA2821 NEMA 4X enclosure into one low-cost package. The scanner provides automatic switching for multipoint display and alarms. Signal switching is done via reed relays making the Watchdog Demo ideal for demonstrating switching of up to eight thermocouple or RTD inputs. Demo Kit Includes: Watchdog model PD765-6X2-00 and PD138-3 MINIMUX II Scanner inside, and PDA2821 Plastic NEMA 4X Enclosure. 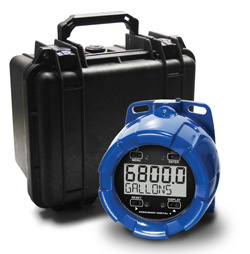 The PDD6700 Vantageview Demo is a plastic, field mounted, loop-powered process meter fully featured for demanding applications in wet or dirty environments. It features a plastic NEMA 4X, IP65 enclosure, 4-20 mA Input loop power, a 5-Digit, 0.7" (17.8 mm) upper display, a 7 alphanumeric character, 0.4" (10.2 mm) lower display, SafeTouch® through-window button programming, and much more. The demo includes a process input signal generator which allows you to demonstrate the meter anywhere there is an electrical outlet. 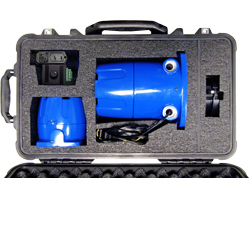 Demo Kit Includes: Vantageview model PD6700-0K0 inside, PDA20-PD signal generator, and a hard plastic carrying case with molded foam interior for ultimate protection. The PDD6701 Vantageview Demo is a plastic, field mounted, loop-powered feet & inches level meter specifically designed for level applications in wet or dirty environments. 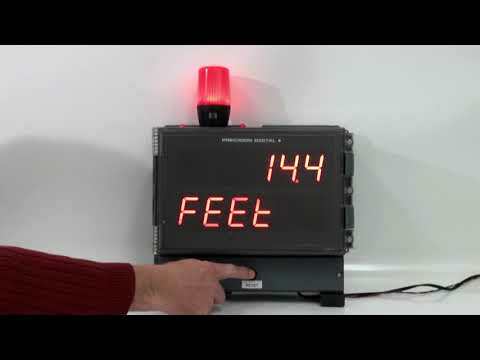 The PDD6701 features a 20-segment tank level indicator, a clearly labeled feet and inches display, and can display in eighths or sixteenths of an inch. It also features a plastic NEMA 4X, IP65 enclosure, 4-20 mA Input loop power, a 5-digit, 0.7" (17.8 mm) upper display, a 7 alphanumeric character, 0.4" (10.2 mm) lower display, SafeTouch® through-window button programming, and much more. The demo includes a process input signal generator which allows you to demonstrate the meter anywhere there is an electrical outlet. 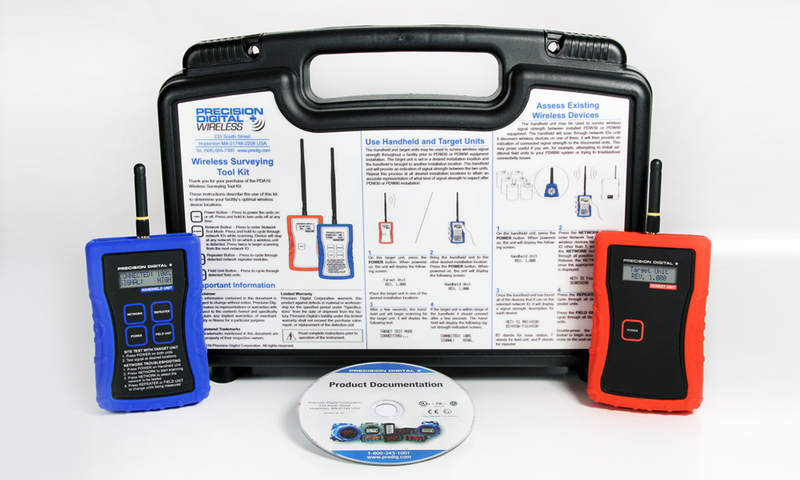 Demo Kit Includes: Vantageview model PD6701-0K1 inside, PDA20-PD signal generator, and a hard plastic carrying case with molded foam interior for ultimate protection. 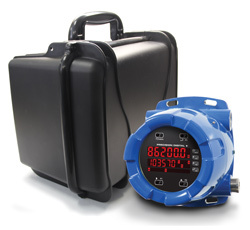 The PDD6730 Vantageview Demo is a plastic, field mounted, pulse input rate/totalizer designed for rugged and demanding applications in wet or dirty environments. It features automatic rate, total, and grand total unit conversions, on-board data logging, and two isolated open collector pulse outputs, up to 5 kHz. The demo is battery powered and includes a momentary trigger switch for pulse generation which allows you to demonstrate the meter right out of the box. No need to plug this meter in, just take it out of its carrying case and you are ready to go! Demo Kit Includes: Vantageview model PD6730-BM0-0 inside, PDA8068 serial cable, a momentary trigger switch for pulse generation, and a hard plastic carrying case with molded foam interior for ultimate protection. The PDD6730X-DEC Vantageview Demo is a plastic, field mounted, serial input RS-485 Modbus® RTU scanner designed for rugged and demanding applications in wet or dirty environments. It features a two-line decimal and alphanumeric display, can scan up to 16 Modbus process variables, and can be used in master, slave, or snooper modes. Demo Kit Includes: Vantageview model PD6730-AX0-I-2 inside, PDA8068 serial cable, a momentary trigger switch for pulse generation, and a hard plastic carrying case with molded foam interior for ultimate protection. The PDD6800 ProtEX-Pro Demo meter is an explosion-proof, loop-powered process meter that brings modern design, easy readability, and enhanced functionality to hazardous areas. It features an explosion-proof NEMA 4X, IP68 enclosure, 4-20 mA input loop-power, a 5-digit, 0.7" (17.8 mm) upper display, a 7 alphanumeric character, 0.4" (10.2 mm) lower display, SafeTouch® through-glass button programming, and much more. The demo includes a process input signal generator which allows you to demonstrate the meter anywhere there is an electrical outlet. Demo Kit Includes: ProtEX model PD6800-0K0 inside (meets all demo requirements), a PDA20-PD signal generator, and a hard plastic carrying case with molded foam interior for ultimate protection. 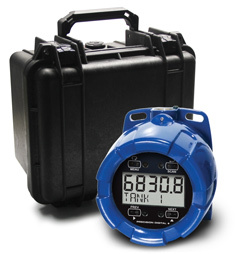 The PDD6801 ProtEX-F&I Demo meter is an explosion-proof level meter that brings modern design, an easy to read feet and inched display, and enhanced functionality to hazardous areas. 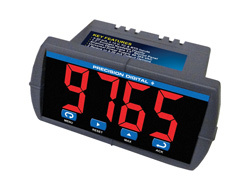 The PDD6801 features a 20-segment tank level indicator, a clearly labeled feet and inches display, and can display in eighths or sixteenths of an inch. It also features an explosion-proof NEMA 4X, IP68 enclosure, 4-20 mA input loop power, a 5-digit, 0.7" (17.8 mm) upper display, a 7 alphanumeric character, 0.4" (10.2 mm) lower display, SafeTouch® through-glass button programming, and much more. The demo includes a process input signal generator which allows you to demonstrate the meter anywhere there is an electrical outlet. Demo Kit Includes: ProtEX model PD6801-0K1 inside, a PDA20-PD signal generator, a PDA20-PD signal generator, and a hard plastic carrying case with molded foam interior for ultimate protection. The PDD6820 ProtEX-RTA Demo meter is an explosion-proof, loop-powered rate/totalizer that brings modern design, easy readability, and enhanced functionality to hazardous areas. It features an explosion-proof, IP68, NEMA 4X enclosure, 4-20 mA input loop power, a 5-digit, 0.7" (17.8 mm) upper display, a 7 alphanumeric character, 0.4" (10.2 mm) lower display, SafeTouch® through-glass button programming, and an open collector pulse or alarm output. The demo includes a process input signal generator which allows you to demonstrate the meter anywhere there is an electrical outlet. Demo Kit Includes: ProtEX model PD6820-0K1 inside, a PDA20-PD signal generator, and a hard plastic carrying case with molded foam interior for ultimate protection. 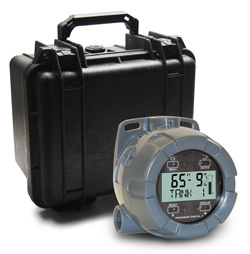 The PDD6830 ProtEX-RTP Demo meter is an explosion-proof, loop-powered pulse input rate/totalizer that brings modern design, easy readability, and enhanced functionality to hazardous areas. It features automatic rate, total, and grand total unit conversions, on-board data logging, and two isolated open collector pulse outputs, up to 5 kHz. The PDD6830 comes equipped with a momentary trigger switch for pulse generation and a PDA8068 USB adapter for connecting directly to a PC. It is battery powered so it is ready to go right out of the box! There is no need to search for wall outlets with this demonstrator, just take it out of its carrying case and you are ready to go! Demo Kit Includes: ProtEX model PD6830-BM0-0 inside (meets all demo requirements), PDA8068 PD6830 to computer USB adapter, a momentary trigger switch for pulse generation, and a hard plastic carrying case with molded foam interior for ultimate protection. The PDD6830X-DEC ProtEX-MS2 Demo is an explosion-proof serial input RS-485 Modbus® RTU scanner. It features a two-line decimal and alphanumeric display, can scan up to 16 Modbus process variables, and can be used in master, slave, or snooper modes. Demo Kit Includes: ProtEX model PD6830-AX0-I-2 inside (meets all demo requirements), PDA8068 serial cable, a momentary trigger switch for pulse generation, and a hard plastic carrying case with molded foam interior for ultimate protection. The PDD6830X ProtEX-F&I Demo meter is an explosion-proof serial input RS-485 Modbus® RTU scanner. Its top line displays level in feet and inches up to 399 ft, 11 and 15/16 inches and includes a 20-segment tank level indicator. The PDD6830X-F&I can also scan up to 16 Modbus process variables, and can be used in master, slave, or snooper modes. Demo Kit Includes: ProtEX model PD6830-AX0-I-L inside, PDA8068 serial cable, a momentary trigger switch for pulse generation, and a hard plastic carrying case with molded foam interior for ultimate protection. The PDDEXP Carry-On Case Demo is a sample set of ProtEX explosion-proof meters that include a PDD6800 Demo, a PDD8-765 Demo and a PD6801 electronics module. This is a good representation of Precision Digital's ProtEX family of explosion-proof meters built for hazardous areas and includes models with loop-powered, large display, feet and inches display, NEMA 4X IP68 enclosures, Safe-Touch® button programming features, and much more. Demo Kit Includes: PD8-765-6X2-10 ProtEX-MAX process and temperature meter, PD6800 ProtEX-Pro process meter, PD6801 module, PDA20-PD signal generator with wires to connect to the PD6800, and a hard plastic carrying case with molded foam interior for ultimate protection. The PDD8-765 ProtEX-MAX demo meter is an explosion-proof version of the Trident X2 and has complete product world-wide approvals. It features an explosion-proof IP68, NEMA 4X enclosure with flanges for wall or pipe mounting, a huge 1.2" sunlight readable display, max/min display, SafeTouch® through-glass button programming, linear or square root signal conditioning with low-flow cutoff, transmitter power option, Modbus® RS-485 serial communications, and more. The demo includes a process input signal generator which allows you to demonstrate the meter anywhere there is an electrical outlet. Demo Kit Includes: ProtEX-MAX model PD8-765-6X2-10 inside, PDA20-PD signal generator, and a hard plastic carrying case with molded foam interior for ultimate protection. The PDD8-6200 ProtEX-MAX demo meter is an explosion-proof analog input flow rate/totalizer with complete product world-wide approvals. 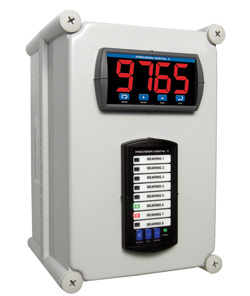 It features an explosion-proof IP68, NEMA 4X enclosure with built-in flanges for wall or pipe mounting, sunlight readable display, SafeTouch® through-glass button programming, the ability to display rate and total simultaneously, open channel flow with programmable exponent, isolated 24 VDC @ 200 mA transmitter power supply, total, grand total, or non-resettable grand total, Modbus® RS-485 serial communications, and more. The demo includes a process input signal generator which allows you to demonstrate the meter anywhere there is an electrical outlet. Demo Kit Includes: ProtEX-MAX model PD8-6200-6H0 inside, PDA20-PD signal generator, and a hard plastic carrying case with molded foam interior for ultimate protection. The Trident X2 Intro Meter Demo is an empty Trident X2 meter case that is light weight and has actual size digits printed on the faceplate. It is the easiest demo you will ever give! There are no buttons, switches or wires to plug in. This is perfect for the last few minutes of your sales call. Just take it out, stand back about 30 feet from your customer, and show off the large display size. Demo Kit Includes: Empty Trident meter case and faceplate with actual-sized printed digits. The Helios Intro Meter Demo is an empty PD2-6000 case that is light weight and has actual size digits printed on the faceplate. Just holding this demo in front of the customer can be enough to impress and make the sale! That's all you need to do is show it; no wires, plugs, or programming. This is perfect for the last few minutes of your sales call. Just take it out, stand back and show off the large dual-line display size. Demo Kit Includes: Empty Helios PD2-6000 meter case and faceplate with actual-sized printed digits.